Meet my brand new son, Daniel. All I can say is Allahuakbar. 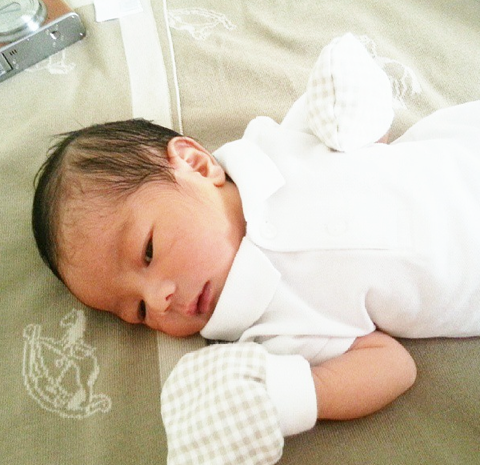 Welcome to the world boy… u’re so cute. Congrats to both of u Vivy & Dean. Subhannallah..Alhamdulillah..congrats VV..such an adorable baby! Subhanallah. He is so adorable. now u can start enjoying motherhood to the fullest. hensem boy..muka bijak baby D ! Assalammualaikum. Tahniah Vivy…such a handsome boy. barakallah Vivy and Dean. welcome to parenthood. Muahhhxoxoxo for Baby Daniel …. welcome to the world my dear cute baby..
so fair like mummy …btw,what is his full name ? I’ve been following your blog since I chanced upon it somehow. Must be fated to cos when I chanced upon it, I found that I was expecting… Your musings on pregnancy have made me feel less lonely! Thanks for the fashion updates abt how to dress the bump for everyday women and for your honest sharing! Haven’t commented till now and feel compelled to! Congratulations on the birth of your darling son!! He’s gorgeous like u!! Assalamualaikum Daniel. Don’t grow too fast. Grow strong, healthy and wise! Congrats on the new born!! Congrats to Vivy & Dean..
Alhamdulillah & congratulations! Precious baby D. Subhanallah, this is unconditional love! both Dean & you must be over the moon 🙂 Enjoy mummyhood! Silent follower on your blog. Congrats on your new bundle of love! Alhamdulillah… Congratulations to Vivy & Dean! Looks like u vv! Congrats to u and dean. Alhamdulillah. Dah selamat bersalin. Congrats to both of you. Alhamdulillah. Congratulations for the new edition of your family. I’m also speechless seeing the photo because Daniel Azim Shah is sooooo cute plus handsome. It is truly a miracle of life. Masya Allah. congratulations, vivy&dean!! 🙂 supercute daniel insyaAllah will rock your motherhood! lahir2 dah pakai stylo kan hihi. take a good rest and enjoy the journey being a mom. Congrats VV & dean! Alhamdulillah. Baby daniel is sooooooo cute! Alhamdulillah, ahlan wasahlan baby Daniel. you’re too cute. Congratulation Vivy&Dean……..
Oh goodness your new bundle of joy is too adorable beyond words, geramnyaaaaa ..Congrats to you & hubs ! Nak tgk how mama vivy berpantang. Mana tau the confinement outfit akan keluar di FV plak. Congratulations on the arrival of your beautiful boy! Vivy, he’s adorable! Congrats to both of u! tahniah vivy. a young mum. adoi, jeles!!!!! omg..omg vivy, i knew u already delivered since past few days u keep silence and all the comment said u already delivered. shida nak sangat tgk gambar anak vivy, thanks coz upload it. Alhmdulillah .. U definitely beat kate middleton on this;p hehe…. I’ve been a silence follower since, but i just have to comment on this post. Congratz vivy and hubby!! sumpah comel anak u. Happy for both of u! Alhamdulillah…. Congrats Vivy & Dean. Definitely a blessing from Allah! So cute! May he grow to be a good Muslim and a good son. Congratulation VV & Dean. Alhamdulillah for the safe birth. Alhamdulillah..the best Ramadhan gift….congratulations Vivy & Dean..
Congratulations kak vivy !! Tell Daniel I say hello okayy 😉 Enjoy your pantang ! Mabrouk mabrouk mabrouk..alhamdulillah…alhamdulillah, alhamdulillah..very happy for u n dean vv..
Congratz to you and and Hubby, Vivy. Baby D is so cute. Subahanallah..
Greeting from Rock a bye Baby Online Shop. Our expertise is to help mommies to get the GENUINE product of AVENT and Earth Mama Angel Baby, brought directly from US and UK, with UNBELIEVABLE price for up to 50% cheaper than Malaysia retail price. Like our FB to view all available items and promotion update.